Experience Dame Mary Gilmore in her own words. 2015 marks Dame Mary Gilmore's 150th birthday, and to celebrate, historian Maree Brassil and The Museum of the Riverina have curated a collection of the Dame's reflections on life in and around the Riverina. Read her musings on local early settlement, wildlife, bushrangers, Aboriginal land and fishery management and more, from the pen of the Riverina's most distinguished writer. Image: Dame Mary seated in her Sydney flat at her writing table, seated in what had been her writing chair since 1912. 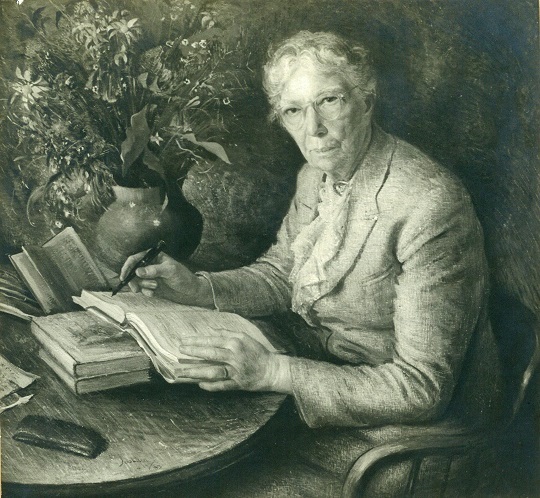 Copy of a painting by Joshua Smith which hangs at the National Portrait Gallery – the photo was presented to WWCC upon the occasion of Dame Mary's visit to the City in October 1947.